BEHRINGER - DJ Pro Mixer - DJX750 In Excellent Condition, With Box. 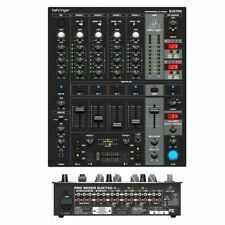 Behringer VMX1000 professional 7-channel rack-mount DJ Mixer BPM counter. Condition is Used. Boxed with manual and power lead. 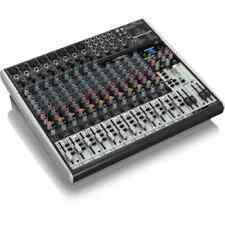 Here I have my Used 4 channel Behringer DDM4000 Digital Pro Mixer. This is a 32-bit 5-channel digital dj mixer with bear-synced sampler, 4 multi-fx section, dual patented bpm counters, digital cross fader and midi. FX has 12 inputs and 2 Aux Sends for each channel. The XENYX FX mixers incorporate a new studio-grade 24-bit FX processor. 4 state-of-the-art XENYX Mic channels. Flight Case Hardware. Power Input: 230Vac@50Hz. Very good used condition & in full working order. Used behringer ddm4000 mixer in full working order. 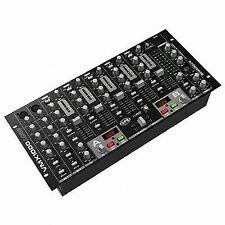 PRO MIXER VMX300 Professional 3-Channel DJ Mixer with BPM Counter. Item model number VMX300. Mixer Channel Quantity 3. Front-panel 3-way kill switches with revolutionary keyboard-like tap & hold action. Behringer ddm4000 dj mixer in full working order. 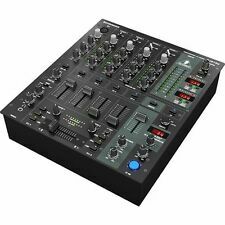 Behringer DDM4000 4-Channel Professional Digital DJ Mixer inc Warranty. Behringer DJX750 5 Channel DJ Mixer With FX Zb490. Condition is Used. Dispatched with Royal Mail 2nd Class. 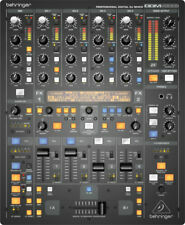 Behringer DJX700 Dj Mixer unit which has been tested and works fine. 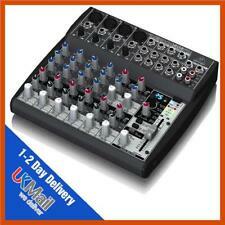 BEHRINGER VMX1000USB PRO DJ MIXER. The VMX1000USB, VMX300USB, VMX200USB and VMX100USB DJ Mixers are built to connect directly to your computer and take your music straight into the digital realm. Their adjustable crossfader curves let you quickly adapt to various mixing styles. 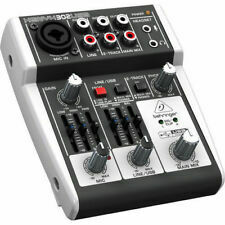 Behringer X2222USB Xenyx Small Format Mixer. Premium ultra-low noise, high headroom analog mixer. Premium ultra-low noise, high headroom analog mixer. New studio-grade FX processor with 16 editable presets including reverb, chorus, fl anger, delay, pitch shifter, multi-effects. Conceived and designed by BEHRINGER Germany. Professional 5-channel ultra-low noise DJ mixer with stylish, black design. Built-in USB interface for recording and playback of any digital music file. Works with your PC or Mac computer—no setup or drivers required. Clip LEDs on all channels and dedicated inserts on all mono channels. Main output plus separate Phones and CD/Tape outputs. High-quality components and exceptionally rugged construction ensure long life. 3-Band kill EQ and precise level display with "peak hold function" per channel. Adjustable crossfade curve for all mixing styles. Behringer djx700 dj mixer in full working order. Behringer DX626 Pro DJ Mixer. The PRO MIXER DX626 is a professional high-quality 3-channel DJ mixer with integrated Beat-Per-Minute (BPM) counter, and embodies a proven 3-channel design loved by DJs worldwide beginners and professionals alike. Behringer djx750 dj mixer in full working order. Premium ultra-low noise, high headroom analog mixer. Premium ultra-low noise, high headroom analog mixer. Built-in stereo USB/Audio Interface to connect directly to your computer. New studio-grade FX processor with 16 editable presets including reverb, chorus, fl anger, delay, pitch shifter, multi-effects. The VMX1000USB, VMX300USB, VMX200USB and VMX100USB DJ Mixers are built to connect directly to your computer and take your music straight into the digital realm. In an instant, these mixers allow you to record and play any digital music file with your PC or Mac computer with no setup drivers required! The VMX100USB DJ mixer is built to connect directly to your computer and take your music straight into the digital realm. In an instant, this mixer allows you to record and play any digital music file with your PC or Mac computer with no setup drivers required. The VMX1000USB, VMX300USB, VMX200USB and VMX100USB DJ Mixers are built to connect directly to your computer and take your music straight into the digital realm. Their adjustable crossfader curves let you quickly adapt to various mixing styles. The Behringer DJX750 Pro DJ Mixer from our Range. Professional 5-channel ultra-low noise DJ mixer with stylish, black design. High-quality components and exceptionally rugged construction ensure long lifeTechnical Specification. 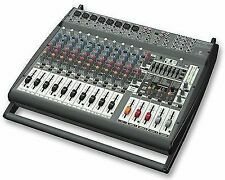 The Behringer SX3242FX mixer features 24 microphone inputs, 8 stereo inputs, 4 buses, 24 bit stereo FX processor with 99 effects. Filter Gel. Premium ultra-low noise, high-headroom analog mixer. CITRONIC 4U & 10U rack case for mixer NEW. The CMD Studio 4A provides all the tools needed to learn the basics of DJing or to work the dance floor into a virtual frenzy. And the Studio 4A not only includes those features it actually improves on them. Mixer: BEHRINGER - X1832USB,Problem with FX fader. must be simple fix. Premium 18 inputs 3/2-BUS Mixer. Small DJ Station Behringer x1832 mixer, Kam Amplifier and Flight case. Condition is Used. Amplifier: KAM KXR1500 Power Amplifier. 2 state-of-the-art XENYX Mic chanels. ● A great mixi mixer at a cracking price. - Colour: Grey. - Power Input: 230Vac @ 50Hz. ● Ideal for adding extra mic/music channels to mixers/amplifiers/sound systems with limited inputs. Used behringer djx700 mixer in full working order. The new BEHRINGER PMP Powered Mixers (2 x 800 Watt stereo, 1600 Watt bridged mode) produce even more power than their predecessors while maintaining a famously low weight and high efficiency. Ultra-compact 2 x 800-Watt stereo powered mixer (1600-Watt bridged mode). The Behringer X2222USB Xenyx Small Format Mixer from our Range. Premium ultra-low noise, high headroom analog mixer. Premium ultra-low noise, high headroom analog mixer. New studio-grade FX processor with 16 editable presets including reverb, chorus, fl anger, delay, pitch shifter, multi-effects. Professional 5-channel ultra-low noise DJ mixer with stylish, black design. High-quality components and exceptionally rugged construction ensure long life. Super-smooth ULTRAGLIDE faders with up to 500,000 life cycles. You'll also need a few standard audio and CAT5 cables. Conceived and designed by BEHRINGER Germany. 16 channel digital stereo mixer to create your personal monitor mix. Solo and Mute functions per channel. Loaded with features typically reserved for larger, more expensive mixers; for instance the Mic input with XENYX mic preamp, which is legendary for its sonic clarity and high headroom performance. Conceived and designed by BEHRINGER Germany. 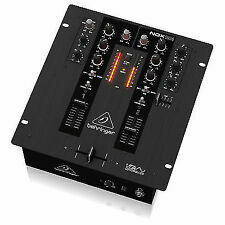 Behringer DX626 Professional DJ Mixer 3 Channel Mixer Ideal For Disco - PA - Dj. Condition is Used few marks here and there fully working condition comes with power lead Dispatched with Other Courier (3 to 5 days). Professional 5-channel ultra-low noise DJ mixer with stylish, black design. High-quality components and exceptionally rugged construction ensure long life. Lighting & Effects. Get in touch. We cherish allInteractions Conatct Us.